Reading my friend Regina's blog http://mostercrochet.blogspot.com got me inspired to write in my blog tonight. You have to read her blog and see they creative spirit that comes out of those pages, enough to inspire the dead to crochet. So here it goes inspired or copied LOL by The Holiday Version of LadyLinoleum. I agree 100 % with her, I like them both. In my old age I have a little eggnog for the holidays and that's it. Puertorrican Eggnog is like Ron Pope in Mexico, you wonder when the heat from the alcohol is going to subside. LOL. Chocolate like my yaya use to make. I miss her still 32 years after her death. You know there is something about wrapping presents, I like the unwrapping more than the wrapping. I use tape, and sometimes ribbons and as the 25th is arriving, presents start to show up under the tree. That's my style. 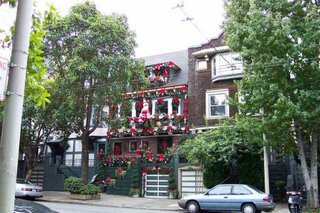 I personally love lots of lights, see the picture of the house at the top, well almost as bad if it was up to me. There is something mesmerizing about twinkling lights. 4. Do you hang mistletoe? Not yet, is not in my cultural data bank. 5. When do you put your decorations up? As soon as I can an etique permits which translates to me Thanksgiving day is the soonest. 6. What is your favorite holiday dish (excluding dessert)? Pasteles. This are the puertorrican version of tamales, wrapped in banana leaves. 7. Favorite Holiday memory as a child? I think my favorite memories were looking at the night sky to see if I could catch Santa Flying. 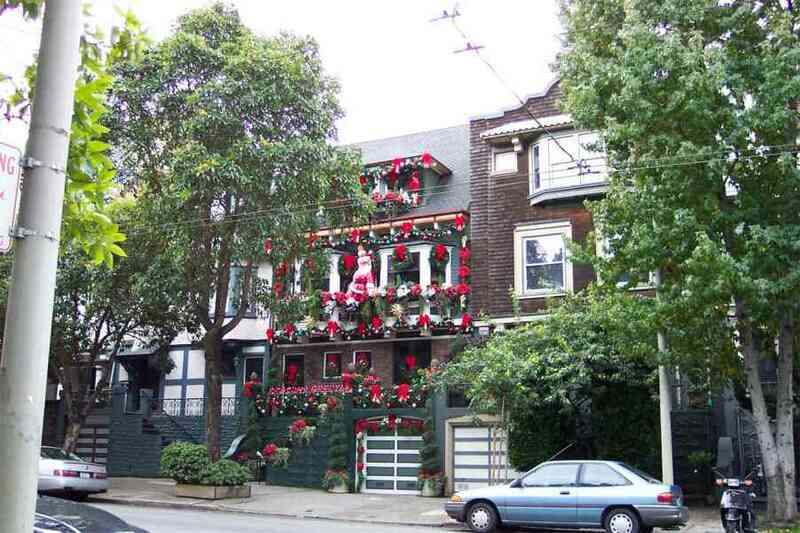 In Puerto Rico Santa has to do something different to get into the houses, we did not have chimney's you know. LOL. 8. When and how did you learn the truth about Santa? One day that my mother and brother where wrapping the presents in during the daytime in my brother's room. I came early from an outing and walked in to the elves wrapping the presents. 9. Do you open a gift on Christmas Eve? Rarely, I like waking up in the morning and surprising myself again! It is a surprise that I can get up and walk, let me tell you that much. 10. What kind of cookies does Santa get set out for him? When Santa came to my house he had already eaten. LOL. That was not part of our tradition and folklore. 11. Snow! Love it or Dread it? I lived in Puerto Rico as a child , snow was an enigma found in the freezer. Once the lady mayor of San Juan, brought snow so the children would experience it , her name Doña Feliza Rincón de Gautier, I believe she was the first woman to be Mayor of a big city like San Juan de Puerto Rico is, in this hemisphere, very well known in the world. She had a plane chartered and there was snow in the Muñoz Marin Park. I like snow for a while. I mean while I am in the mood, it's romantic, cool to see , but it gets messy as well. I lived in Alaska,and Boston, I don't think I need to add anything more. 12. Can you ice skate? You bet! I learned in Puerto Rico. There was this place that had a floor made of some kind of wax and that's how I learned. Was very popular. 13. Do you remember your favorite gift? Mack Mason, space Station. Anything that had to do with space exploration. 14. What's the most important thing about the Holidays for you? Right now the most important thing is about remembering people and sharing with people, living life to the fullest and by God having as much fun as I can before they make Christmas unconstitutional. Your family and extended family, spreading joy. 15. What is your favorite Holiday Dessert? Turrón (Nougat) and Fruit Cake. 16. What is your favorite holiday tradition? Christmas Day Brunch! While Calling my friends and family wishing them a happy holidays. I had to think about that one. 17. What tops your tree? A bunch of curlied ribbons. 18. Which do you prefer Giving or Receiving? 19. What is your favorite Christmas Carol? In English "Silent Night" in Spanish "Noche de Paz." 20. Candy Canes! Yuck or Yum? Can I exchange them for Nougat? Thanks LadyLinolium for the inspiration and a journey to the past. My heart is warm with sweet memories. I apologize for all the talking, that Gemini Moon is very chatty. Awww, you're so sweet Andy! This is a great meme...now I know much more about you. And yes, Abuelita hot chocolate is the best! People just don't know what hot chocolate is until they've had the Mexican version. With cinnamon of course.